BUSHKILL, PA (SUMMER 2016) – Pocono TreeVentures, an aerial adventure ropes course in the Pocono Mountains with 66 elements and five courses, is adding even more fun with two new children’s adventure courses for ages 4 – 7 and night zipping on Saturdays beginning June 18. Gina Bertucci, spokesperson for TreeVentures said, “Our park offers aerial platform to platform challenges from beginner to expert that allows guests the chance to surround themselves in the pastoral beauty of the wooded Pocono Mountain setting. That excitement is elevated when doing the courses in the dark and now even younger children can participate.” Ropes course stay and climb packages include two nights of accommodations in a nearby Tree Tops studio villa with two ropes course tickets for $199 a night midweek. Upgrades to a two bedroom villa are also available for an additional $60 a night. 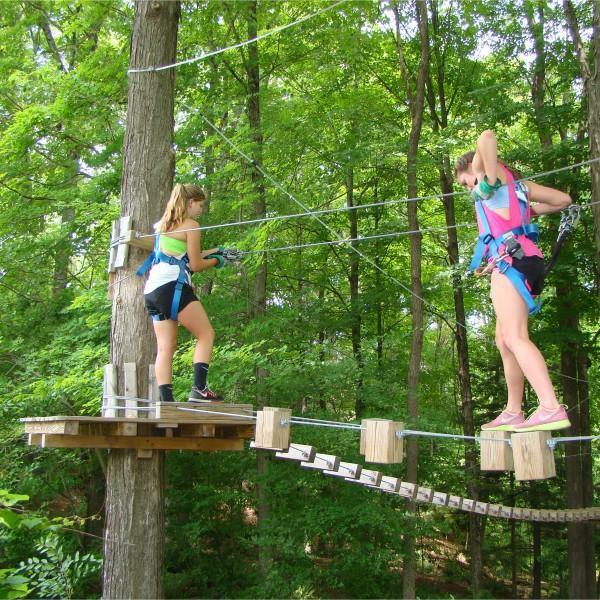 The aerial adventure parks contain courses made of platforms constructed at various levels in the trees connected by bridges that represent obstacles. Tickets are sold in two hour sessions where guests can repeat the same course or continue to increase the level of difficulty at their own pace. The expert course takes you over 30 feet in the trees and has extremely difficult features to challenge even the most experienced outdoor ropes enthusiast. For children not yet ready to scale to such great heights, the new kids courses are elevated just off the ground but include all the same harness and hardware used in the adult courses. In addition to the ropes course, the park also offers Pocono Zip Racer dual racing ziplines that give guests the feeling of flying through the air like a bird. PoconoTreeVentures.com where you can get additional aerial ropes course information and reserve your overnight stay. Pocono TreeVentures is open daily from 10:00 am to dusk throughout the summer.